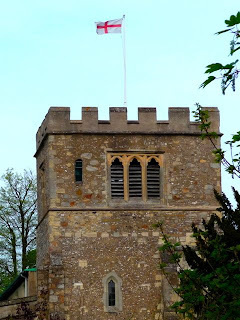 St George’s Day Flags are out around Great Missenden; including on the Church, where I knew it was going up because Lucy is tower captain, and got the call as usual last week. 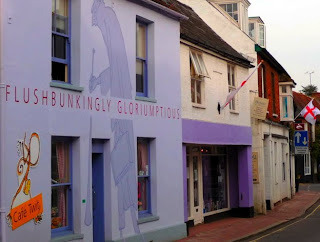 The whole effect was, well, as the Roald Dahl Centre proclaimed, Flushbunkingly Gloriumptious. 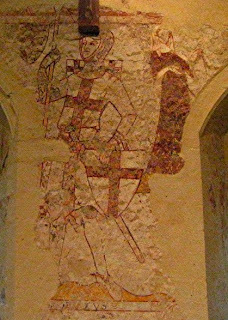 The English Church has done St George in style ever since he came onshore to England during the Crusades. 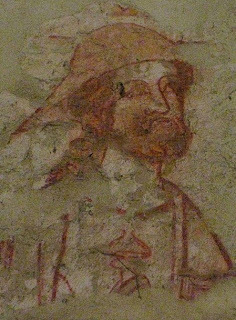 About 600 years ago, for example, an unknown artist painted this gentleman on the walls at Little Kemble — one of my favourite medieval small Churches around here, where I had the great honour of reading the passion on Good Friday, and sometimes snicker out and take a Prayer Book 8.00 servce. In American movies the English make good conmen, toffs, idiots and butlers. 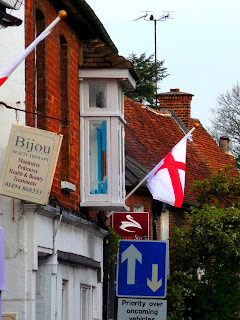 Here at home, if you get the flags out, it conjures up lager louts, flags in cars during the World Cup, Reliant Robin drivers in pork pie hats, old maids cycling to early communion through the mist, and warm beer. You could add fondness for animal charities, language and literature, poor customer service and toy plumbing. 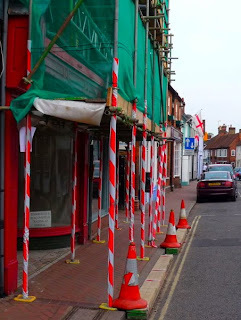 There’s also Fleet Street patriotism — essentially unhistorical, churned out by the yard and presided over by sleazy old hypocrites who bang on about patriotism whilst pretending to live abroad so that the country itself can run on everyone else’s taxes. 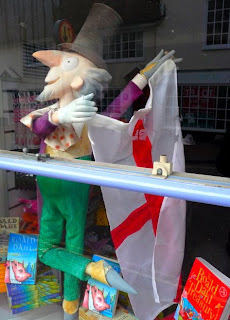 I hope people also think being English is something to do with fairness, scientific curiousity, a quirky passion for personal freedom, amateurism, tolerance, justice for the underdog, tradition and evolution, pragmatism, and creativity. Attempts to define England in racist terms are ludicrous, because the basic fact about this island is that its culture and languauge have been made, and are still being made, by wave on wave of foreign immigrants — Romans, Germans, French, Jews, Dutch, French, Russians, Chinese, Afro-Caribbeans and Asians to name but a few of the most obvious and prominent since 54BC. One of the things I decided I liked about St George as our patron Saint is that, as far as we know, he is not Anglo-Saxon or even Celtic. He too is an immigrant, even if a "post-mortme" immigrant. If we have any idea of his origins, he was probably a Palestinian Christian! "the basic fact about this island is that its culture and languauge have been made, and are still being made, by wave on wave of foreign immigrants — Romans, Germans, French, Jews, Dutch, French, Russians, Chinese, Afro-Caribbeans and Asians"
Oh no not that old canard again. It is of course beloved of those who wish to promote certain agendas and it is certainly true that teh odd dutchman has come over to drain lowland areas and so on but from a statistcial point of view essentially there was no immigration from the time of the Saxons and Viking unitl socialism. True yes, relevant no. It is revisionism. It is fine to say it is good to be rooted but the truth is that the ancestral identity of the British is deemed to be racist because it conflicts with the interests of the peoples who ahve been settled here. We have resisted all invasions since 1066 but we now face an uncertain future, troubled about our identity, scared about what the future will bring, denied the security and clear sense of identity that our ancestors posessed and was our birthright from them. 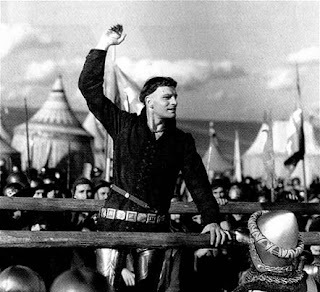 There are those who would through hate, cowardice of self interest would build a new society in Britain on the ruins of our society and people. They show no mercy and yet expect to be applauded. They are traitors and racists for how else can you describe those who treat us with such contempt and distaste? What people have ever been accorded as litte consideration in their ancestral lands? Rosalind, thanks for pointing this out. George certainly arrived on the scene later and displaced SS Edmund and Edward as patron saints for England... Interesting to have an post mortem immigrant patron saint! Dear Anonymous, The most obvious Dutch invasion was 1688, bringing with it a Dutch King, a Glorious Revolution, a new and distinctive concept of constitutional monarchy which has operated in England ever since. You may see this as "an odd Dutchman come over to drain lowland areas," but I think others will see it as more significant than that. Far more influential than military invasions like 1066 (after the time of the Vikings), however, has been the cultural influence of many number of groups in continuous waves. Our language and the names of those who have made our history bear abundant and continuous witness to ths phenomenon. Your quaint telescoping of our own national identities within these islands into "The British" is also radically questionable, to put it mildly. Without a firmer grasp than you demonstrate of the history of your own land, I'm not surprised you feel troubled about your identity, scared of what the future will bring, denied the security and clear sense of identity your ancestors possessed. I would, too. The answer is for you to gain a basic understanding of your own history and culture and where it comes from and how it has operated. You would then have a basis on which to feel more confident, as well as informed. Many thanks for your reply even if it was more than a little patronising - though something tells me that my comment may have had the capacity to provoke in its own way. If nothing else this demonstrates the deeply emotive nature of such questions of identity. I rather agreed with most of what you said about what it means culturally to be english but the question of historical immigration is not just a matter of historical curiosity because the mulitculturalists seek to justify current immigration on the suppsoed basis that there is historical precedent and there is therefore nothing remarkable about it. Its because of such agendas that its necessary to be very careful about such issues. No one is denying that there has been immigration into Britain at various times teh problem is when people try to create a narrative and an identity that Britain is formed from continual immigration (as opposed to say particular episodes hundreds of years ago). This is an attmept at historical revisonism on a grand scale. The question is not whether immigration has taken place but how much of a continual process this has been and on what scale and what consequnces this has had on national identity. Specific immigrations of eg Jews, hugenots and yes the odd dutchman do not make nation of immigrants. The point is these very interesting bits of history concern affect the margins, not the broad mass of national idenity. The glorious revolution, whatever its political significance, did not effect a demographic transformation - the Britsh were not thenceforth a nation of Dutch immigrants. It suggests that even the Celts and the Saxons were not as important to the origins of the British as is usually thougth and in fact the majority of poepple are descended from people who arrived when the British isles were still connected to the continent. I have no idea whether it is correct or not. One thing it does suggest however is that true origins and sense of identity do not allways overlap. Even in fact most of our ancestors were not Saxons or Vikings the narrative of the Red dragon and the White dragon is deeply imprinted and underpins the identities of the Englsih and the Celtic nations. "Your quaint telescoping of our own national identities within these islands into "The British" is also radically questionable, to put it mildly." Actually this is a good point to a certain extent. There is a good argument that the idea of there being a British people is to a certian extent an invention. It is not hwever a new one and certainly not mine. However one feels about it, it has been traditonal for centuires and many generations have lived with a strong sense of Britsh identity and nationhood. It is now under threat from devolution and other attempts to destroy our sense of identity but the fact of this sense of identity cannot be denied. An odd composite form of identity perhaos but a long lasting, successful and powerful one that has had a strong draw on people's hearts. I, for oen ahll not lightly give it up. These British, who built the greatest civilization the world has ever known, what is and was their sense of identity - of being a mixture of immigrants or pf bing part of a broad stream of human history, living in the lands of their ancestors? Whether this is individually true of particular people is irrelevant to the group consciousous of national idnetity. In fact the real history of britain is one of emigration, not immigration, a great river, widening and splitting wiht only a few tributaries flowing in. The numbers follow the shape of the hockey stick graph beloeved of eco-marxist -essentially no immigration beofre socialsim, then on an ever increasing scale. This will shatter that sense of a common history, of the people and characters of Britain's past being our ancestors. It may well be that Britain's future is to be a people of immigrants, but this is not the present or the past and ti si hard to be optimistic about what this future holds. The present evidence suggests this will be a failed society but perhpas it will jsut be a radically different scoiety but it si impossible to pretend that mass immigration that is currently happenning is not unparraleed at least since the Saxon incvasions and perhaps in all of British history. What future will this bring fro those whose ancestors have always lived here and whose group identity relies in part on a sense of shared histroy? p.s. English is in fact a language with a germanic base and heavy romance influence whcih makes heavy use of Greek and Latin in various ways. 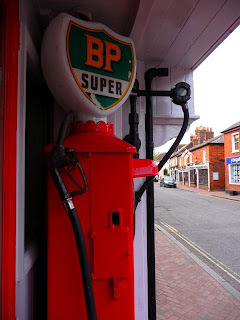 There are many borrowed words but other influences are of very much secondary importance - in fact a product of an historical context centuries ago which has evolved on its own course subsequently. Many thanks for picking this up and taking it on. I think it helps to disconnect from your anxieties about multicuturalism (which I think I largely share with you,if you mean by MC modern political correctness applied to culture), and explore the history. The modern nation state and appurtenances was an invention very largely of the last 200 years. The concept of a race of Britons is similarly modern. When the term is used, for example, in the seventeenth century it is a simple designator for someone who is *not* an Anglo-Saxon! The Temple of British Worthies at Stowe gives some idea of what 18th century Whigs thought Britishness might be... nothing like what you think. They even had a German King who spoke no English. As to immigration, the impact of cultural groups moving into the country has always been intensive in particular localities, but it's continuously happened, sometimes in huge proportionate numbers — nineteenth century Irish, Jews, for example numbered hundreds of thousands in far smaller host populations, and nobody filled their pants, although some hated strangers. At the height of the Empire, some people posited the existence of a "British race," for racist reasons. They also sometimes suggested that diluting it was a source of national decline. Where I think you are right, is in pointing out the movement the other way out of the country, of English speaking peoples. The power of the language has been its sublety, adaptability and power to accommodate diverse concepts, and that is why it has become (largely) the world's lingua franca, as well as the reason people flock to the Uk today. Thanks for pointing me towards the temple of Bristish Worthies (which I had briefly come acroos before but completely forgotten about). Thanks to the glories of the internet within a few clicks I was able to look at it. The choice of the different worthies provides a sort of proxy potted history of what British history was about. However, looking at the people it seemed a suspiciously English view of history. In fact I think they may all have been Englsih. Perhops there is some signiifcance in this. I agree that the British identity is a "modern" creation (at least from a British perspective) but it doesn not mean its an artificial one - it is syncretic of the different national identities not in place of them and also it wouldd seem also to draw heavily on English snese of identity - perhaps an "inclusive" adaptation of Englishness in some respect - or is this just an irritating mistake that has always been made by Englishmen? There seems nothing particularly alien about the sense of history expressed - a modern version would jettison soem of the obsure recent ones, perhaps add Nelson, Wellington, Queen Victoria and Churchill and a few cultural figures and a few that seem important to us as they are recent and it could serve quite happpily for modern tastes. We even still have German monarchs- though their English is rather better today. It is definitely right to mention the immigration of Jews and Irishmen. The first is one of the most signifcant instances of immigration and I think most would think that it has not caused any significant problems. I am not certain whether it was popular at the time and it does not mean because immigration wasnt a great problme in that instance that it is desirable on other occassions. It is possible to argue that the more immigration that takes place the less in future the country is able to absorb. The Irish are a special case as they were fro a very long time part of the United Kingdom and thus British to some extent to. I dont think that it is totally unfair to cite it as an example of immigration but the fact that Ireland was unitl recently part of the Union (and part still is) together with the Anglo-Celtic identity behind the concept of Britain means that it is unique. I think, especially in Glasgow, it has not been without its problems. I agree that the impact of immigration has been intenisve in vertain areas. The East End of London I think has its own unique past and perhaps a few other areas of cities may have a somewaht similar histories. These specific areas may well have a traditon of immigration but they are the exeptions rather than the norm. What is true of a few limited areas is not true of the country as a whole. I couldnt agree more about the Englsih language and its adaptabilty to new ideas. The idea of a British race is an interesting one. I think the common modern concept of race in terms of skin colour and so is a modern adaptation of an older more general term (that is unless its simply a misunderstanding of its proper usage on my part). I believe that teh Fabians and the Guardian were heavily into eugenics (while their intellectual decendants are obsessed with race in different ways in the form of multiculturalism and general race hatred towards white people). However when Churchill began his history of the Englsih speaking peoples with a section on "the island race" it was a somewhat different notion of a British race. The idea of an identifiable people. One classic statement of national identity is that of the Greeks given by Herodotus. For him (8.144.2) Greekness is a matter of common blood, common language, common, comon rituals and shrines of gods and a common way of life. One could add a common land and a common state as ideas which also have relevance to identity. I cannot think of any clear evidence that the sense of being a related people with a common past is and has been an important part of what Britsihness means (even if it isnt absolute). Certaibnly this is the impression I have gained from my own experience. Neither, however, do I know of any evidence to the contrary. Partly this is becasue I am ignorant of the evidence. However I think there is a problem in that it is precisely the thing which are most takne for granted that dont need to be said. On the question of diversity and society I think there is little evidence that it makes for a more successful scoiety and quite a lot that it leads to problems if not to conflict. The experience of the Balkans, eastern europe, rwanda and many other places point in a different direction. ENoch Powell of course famously warned of the danger of communitarianism. I find the analogy of the family and the home a poweful one and perhaps it is a natural human analogy. In theory it might be a good idea if society wasnt divided into families but if everyone had equal bonds with all others and shared living space. In practice this tends to be a bad idea and to lead to conflict, unhappiness and mutual resentment. Far better to let people live in their homes in there own way. It produces a lot better relations with their neigbours not because they are pushed together but because they are apart. There is a tendency sometimes to see human conflict as a matter of mutual ignorance. This is rarely the case - the Israelis and the Palestinians and closer to home the people of Northern Ireland dont suffer from mutual ignorance but rather too close knowledge and contact with the other. Confglicting senses of idnetiy and conflciting claim to ownership of the land. The harsher forms of nationalism have largley been absent from Britain's past due to the security and clear borders that others have lacked. The example of the US is not clearcut. While it is certainly a nation of immigrants it like Australia and Canada and New Zealand demonstartes rather the success of British or English civilization in all the regions fo teh world, not just in our temperate climes. While some claim that teh US is an exmample of successful "civic nationalism" i.e. nationalism with reference to the state (and the constituion) I dont believe that American nationalism is a simple as that. Rather there has been an evolving sense of American-ness; for instance from north european protestant to european christian with a common assimilate anglicized culture. WHat the future holds for America is not clear. In any case the vast lands of the US populated by a nation built from immigration are very different to the ancient, heavily populated UK. Here social cahnge is not in the situation of building a new society where none existed before but in the context of tearing apart the settled communities and strong social cohesion that have previously existed. Well, I had better stop now as I have rambled on too long already. This probably isn't the most constructive contribution (and I may be one of those thought to have an agenda for making it) but, while taking seriously the exchange of views here, "add Nelson, Wellington, Queen Victoria and Churchill" made me smile since, although Nelson is firmly the child of an English Rectory, Wellington was an immigrant as were the mothers of both Queen Victoria's and Churchcill. An interesting observation that occurs to mind is always welcome in my view. I agree that our monarchs have often not been very British in ancestry since at least William the conqueror. Churchill's mother was American but while this meant she was from another land and another state however Americans to at least a considerable extent had shared blood, shared language and a lot in common in religous practice and way of life. Wellington, I believe, would have been surprised to have been viewed as an immigrant. The act of Union with Ireland happenned during his lifetime but this was an evolution in Ireland's consitutional status and does not mean it was a foreign country before. In any case his family originated in England. He would have been Anglo-Irish. One of things he is famous for is saying that just becasue somebody is born in a stable does not make them a horse. However I think whether they were of British ancestry is not the most important point - it is the Britishness of the history that matters more. (1) I'm really with Jonathan Clark in thinking the whole idea to package up something as "Britishness" is actually the exact opposite of the way we have historically operated. We are and always have been a very implicit kind of society, and are frankly embarrassed by some of the things the French get up to in this regard. (2) Our genius has been Liberty in the Miltonian sense and adaptabiity. Having any single meta-identity strikes me as an inherently hisyoricist and probably fascist enterprise. (3) Historically speaking, Fernand Braudel wrote a very interesting book years ago about how French identity developed out of the historic landes. We are even more inherently and profoundly not one society — Scots in America do not take kindly to being called English! Our values are derived deductively, not inductively. I heard that there was going to be programmes on Britishness but I missed them as I knew they would annoy me as they were on the loony leftie BBC and by Matthew D'ancona who while senisble on many things is if its not perhaps fair to decribe him as fully mullticultural in his viewpoint and least very metropolitan so that I would guess that outside London he would be happier in Paris or NEw York than in most of Britain. A common enough trait amongst the journalistic class. A question of where ultimate loyalty lies, as often enough not to Britain but to their own particular metropolitan and superficaily multicural milieus. Such people do much damage as in the fierce loyalty to their own mini-cultures they often wish to pull down the rest of a society in an act of missplaced loyalty. However as I missed the programmes and they do not seem to be on the intenret I may have misjusged his approach. Thanks for the various thoughts put forward. I must confess that I think they have gone a bit over my head as the referneces I had not come across and the terminligy I am not familar with. However if I haven't totally misunderstood I think I am in complete agreement. I agree that Britain (or the UK) is not one society. Not just that diferent countries and nations are included but even within England there are massice differences (and no doubt it is the same in the others). Indeed in terms of accents (which reflect cultural/societal differences at least in part) large numbers of people are simply incomprehensible. However this doesnt mean that there isnt a clear sense of commonanality both on the level of the individual nations and in my view a clear sense that the different nations constitute an identifiable whole. I am not sure about whether it is possible to be fully both identities or if one is to some extent at the expense of the other. I agree that national values are derived from what has developed not from first principles. A big contrast fromsay French principles of liberty, equality and fraternity possibly (though I dont really know enough about French society and political culture). Caertianly the idea of a state with particular cultural values (such as secularsim) is deeply alien. Identity and values are things whcih have devleoped and evolved and are understood rather that directly conceptualised. Certianly the idea of imposing a particular identity, especially one at the expense of other identities, seems very wrong and very untraditional. I think all reasonable people can agree at the ghastliness of the Gordon Brown style Britishness consdered a while back with the attempt to categorize Britsih values (seemed oddly close to Socialism) and even the idea put forward by Lord Falconer of swearing allegiance to the Queen. How terribly un-British. Acceptable for foreigners perhaps but not for us. We have older deeper values and identities. There was a deep sense of irony in that zanuLabour was seeking to try to promote a snese of Britishness precisely because it itself had done so much to weaken the sense of a coherent group identity. After destroying so much of what had existed in the past it had nothing to replace it beyond the most worthless and shallow ideas. Socialism is ever thus. Quite why htey think that tearing down what is old and tradtional will magically produce some utopia is beyond my ken. However, this socailist vision of Britishness is a world away from the living, breathing sense of British identity that I know not because of it being imposed or invented but becasue I was born into it, grew uo into it, and live in a society where it is a shared assumption. This may not be the case for everyone in the UK, it may be an idenitty that dearer tos ome than others and it may well be a dying cultural viwpoint but nonetheless it is mine and that of a great many others. Quite what it means, the more I think about ti the less I am sure. Perhaps it is largely ENglsih nationalism dressed up with heavy doses of monarchism, unionism, a bit of whiggery, a little protestantsim and imperialism, a deep respect and loyalty to shared institutions and more than anything a sense of deep pride in our shared past and present and a profund sense of togetherness, that we includes all the nations of the Uk, not just the one to which the individual belongs. Deep lack of selsishness for ones own nation with a powerful sense of being in things together whether the empire or WW2 or any other endevour or trial. Perhaps this has all rather gone with the wind after 12 years of Labour misrule. There are very many who say that was the past; we are English now. I can see why one can argue that its not as deep or meaningful or real as the constituent nationlaities and yet it has had an extroadinary power to command peoples hearts and to command their loyalty. Generations who have lived proud to be British, perhaps especially amongst the Englsih where the dividing lines between the two identities are less clear. The failure to distinguish between the two is perhaps irritaing to those who arent English but reflects teh Englishman respoinsble's commintment to the Union not their contempt for it. I came across a few days ago this statement whcih expressed a interesting Britiish persective albeit from an actor. "Devolution was the worst thing to happen to our country, a complete dereliction. During the war, I was in the army with Scots and we were all very close, we had to stand together because we couldn't have done it apart. We should have stayed together." Searching for Jonathan Clark (of whom I had never heard, but sounds my sort of thing) I came across a review whose synopsis of his ideas of British idenity seemed to coincide with mine. "In politics, the Postmodernist disparagement of the past has underlain New Labour's insouciant scrapping of much of the United Kingdom's historically evolved constitution: witness the abolition of the House of Lords, the Lord Chancellorship, and the undoing, after 300 years, of the Union between England and Scotland. It also underlies the Blairite vision of England in Europe. For if our national identity as British or English lacks (or can be dissociated from) any deep historical roots, then why should we not simply "construct" a new sense of Englishness to fit our status as a province of the European super-state? True, Clark concedes, national identity has been constantly changing; but it does not follow that it is therefore shallowly rooted or recently "constructed". In a brilliant chapter, ranging from the Anglo-Saxons to the present, Clark establishes that most of the defining attributes of our sense of Englishness have remained remarkably stable for over 1,000 years. England's Union with Scotland in 1707 produced a new emphasis on "Britishness"; but this was synthesised out of already existing, "ancient identities" and co-existed beside, rather than supplanting, these earlier forms of national consciousness. Of course, this process of de-historicising contemporary culture - what Clark terms the dominance of "presentism" - is a result of more than merely the latest modish "-ism" to captivate gullible dons. Clark associates it with a series of other contemporaneous trends. The decline of the Christian churches, which once rivalled nation states as "historical vehicles for human consciousness", has assisted in desensitising us to the past. So too have fashions in schooling, which have produced an ever-narrowing chronological range to children's familiarity with the past. With most secondary pupils now fed a remorseless diet of "Third Reich studies", few currently have any sense of any historical period before about 1900; numbers taking medieval history are in steep decline; and Classics - the route of entry into the experience of Greece and Rome - is now virtually extinct." It was interesting and thoughtful though I dont't think I understood most of it. A couple of ideas I did pick up on was the importance of understianding the fullness of the complexity of how a culture came to ens up where it did ( and thus an understanding of how cultures are not static but evolove). Also how cultures and societies change by interaction. Which may or may not be what this means: "the ‘furthering’ of a human agenda shaped by converging and negotiating convictions, offers a moral touchstone for intercultural debate that may not be clearly identifiable in the abstract but emerge in the historical encounter between cultures as a common ground that allows both agreement and further exploration of disagreement"
The sense I got (possibly incorrectly) was that cultural evolution is something that takes place. I am convinced by this. What struck me was how unfair this was in the British context. It may be the case that society can adapt so the new cultures and religions can be absorbed. It seems to me however that to ensure the belonging of new cultures and people it has to be at the expense of those to whom the society previously belonged. Even if the new society is successful it will not be so fulle theirs. I Britain we were told that we could not object to alien peoples being settled here as they would not affect our lives and thereofre it was racist to be agaisnt it. It is not fair for us then to be told that we have to compromise on our society and identity in order to accomodate and integrate such people (otherwise we are racist). There are many who accept immigration but who veiw the price of this to be that immigrants have to give up their cculutre and identity and adopt that of the new nation. I insticntively dislike this imposition of culture and idnetity but the argument is that those on whom this is imposed have chosen it by their cjhoice to move. This point of view defends teh civilization as opposed tot the people. If you arent goign to impose a cluture and identity on people it seems inevitable that setttling alien people with a settled society will profoundly change the communitesd and sense of identity leading to either some being second class citizens or to erosion of the sense of common identiy. To often with immigration the wrong question is asked. People ask - are they good people when the correct question is - are they our people. Human nature being what it is most people would rather live with their own family in their own home rather than with saints in palace. I recently read Jonah Goldberg's fascinating book "liberal fascism". His view that any attempt to have a sense of communal belonging tied to the state outside a sort of civic nationalism was proto-fascist. He makes a good argument but we know from our past in this country that it is posisble to have a very civilised sense of natioanl belonging. This is partly becasue of our culture and political heritage an partly because with the deep security on our own island(s) we have never felt the same "blood and soil" type of nationalism that has threatened central and eastern Europe. That sort of Nationalism in Britain is the result of socialist contempt and hatred for the British people and attempt to govern agasint the greain of human nature instead of with it. Another great triumph for Socialism. In the past it has been possible to have the good bits of tribalism - a clear sense of common clutural and social identity without the bad bits (such as teh bad sides of tribalism and nationalism or the imposition of and identity or values on people). Tihs has been possible because of genuinely being (to a large extent) a common people with shared assumptions. This is a rare preciosu thing. In truth however much Labour may witter on about the desirability of us and especially are children experiency as mcuh otherness as possible it runs deeply against teh greain of human nature - teh deep longing for belonging and shared assumptions, where event the fault are our faults. With all the otherness that the world craves it is familiarity, not exoticness that is of incalculable value. The homeliness that makes our land so dull to some, familiar land, fmailiar faces, familiar accents, familiar customs. Those who have wished to escape this have always been able to but the home we have alwasy had can not be replaced if it is turned into a hotel or house for any who wish to live there. It may be a great residence but it will not be home. It may well be that current culture and society has developed out of teh disruptions of the past. This can never justify the destrcution of current society. America may well have been a nation of immigratns but this could never justify the destrcution of teh relativel choseive society that existed in the fifties that was sacrificed to political ideology and socilasit hate by, most prominetly, Ted Kennedy. Nor can British society be destroyed on any precedent of past turmoil. Yes cultures adapt but why should ours? In any case I wonder how much willingness there will be to forgive. The British are teh easiest people to exploit -all you have to do is appeal to their soft hearts. But if you really wish to anger them then their sense of injustice has to be invoked. State propaganda is immensely powerful of course. What use is a patron saint to a protestant country? You could make out a case for it in orthodox Russia or catholic Spain; they expect favors from praying to these people.